Market direction: UP, but recovery must be confirmed. 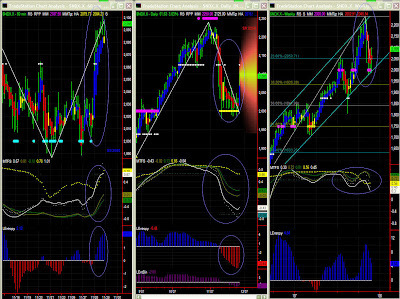 See yesterday's post ("Check Cycles") as well as NDX and SPY commentaries today. 60mins: Up, but recovery must be confirmed. Admittedly surprised by yesterday's move. MTFS and Entropy look better but the MTFS green line is lagging behind while the white line reaches overbought territory very quickly. This indicates a likely pause (we even have a possible AutoFib pattern pointing south). The 150 level could even be tested again for support. We expected a congestion and we got that sudden burst upward. The MTFS crossover on a negative gradient does not point for RUT going much higher for now, and while the fall looks stopped, a stronger base will need to be found to go higher (150?). As for other instruments, cycles seem to show a turning point, however slightly delayed compared to NDX. Looking at MTFS, it is quite possible that such turnaround will occur after a stronger support is found within a few bars. It is interesting to see RUT possibly closing the week over the lower end of the channel. For the time being, let's push the 'double top' scenario a little further (we might dump it in a few weeks). We're therefore now back in our [750-875] range, and pretty much directionless there. Again, RUT has always bounced on PR2 in the last 2 years, and it may just behave the same this time again. Market direction: up, but a pause is likely. Admittedly surprised by the strength of this recovery, even if we knew a breakout was possible. MTFS and Entropy do point higher but caution must be exercised. A pause is quite possible on the way to 150. Despite yesterday's "burst" MTFS and Entropy still do not look great. At this stage we can assume the price erosion has stopped but it is likely that the recovery will need a stronger base. Let's wait until MTFS lines meet. When confirmed, we'll watch for the AutoFib targets and obviously the 50% retracement and MM level at 150. Weekly: congestion - very low significance level. Market direction: Recovery is yet to be confirmed. about checking lower times frames, as something was boiling under the hood. Secondly, I mentioned yesterday that it would be worth taking a look at cycles. Of course, I have warned again that cycles must be analysed with a lot of caution, yet it seems to have proved right this time. 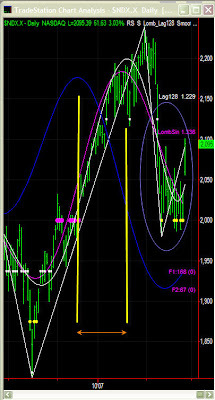 The 2030 pivot level disappeared at the open, and the 2060 didnt show much resistance either. Fractal levels are still about 31 points apart, and NDX gathered enough momentum to get the next resistance level (more significant on lower time frames). Current level can hower pause the recovery. Indeed MTFS and Entropy are strong but 'half-way' through only. Recovery must therefore be confirmed. 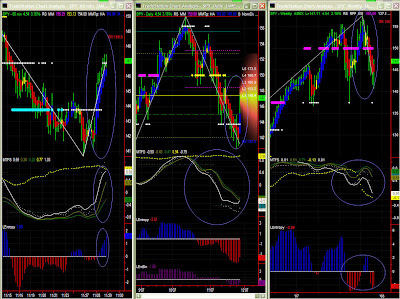 Again, it is recommended to follow the 15mins chart (Sig Level = 92%). I would suggest reading yesterday's commentary again. A bounce was announced, but due caution was also expressed as such recovery could have started from a lower base. Having said that, cycles, AutoFib, and engaging looking at lower time frames should have made possible to be there on time. Where do we go from here? 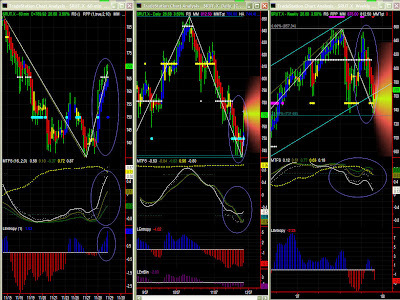 The MTFS pattern is not bullish yet so it is essential to wait to see the recovery confirmed over the next few days. Such recovery after such an incredible day (+3%) will obviously slow down. It is likely that if/once 2125 is passed, NDX will likely return to the overall bullish trend and reach Fib targets. Bounce on the lower end of the channel and 2000 support level should help NDX go a little higher. This is however not a very significant time frame.